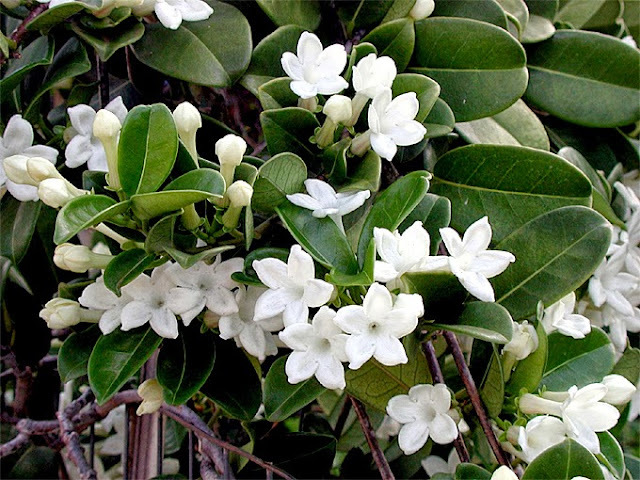 If you are planning to grow the Madagascar jasmine outside then you will need to try and replicate its native conditions as best as you can. Indigenous to the tropical island of Madagascar it has evolved in a climate of high humidity and seasonal cycles of hot, wet summers and cool, dry winters. 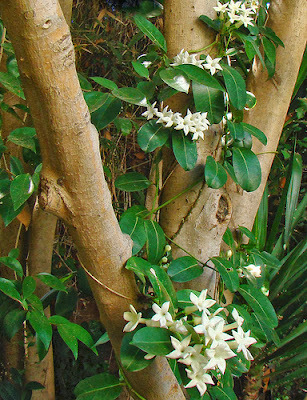 Be that as it may, the Madagascar jasmine is surprisingly hardy and able to cope with short periods of cold weather as low as 4 °Celsius, but will not tolerate frost or freezing of any sort. It needs to be grown in a very free draining soil in order to prevent any root damage through water-logging. Add plenty of horticultural grit to the soil before planting, but you may need to consider growing in a raised bed or within a mound just to be on the safe side. Always allow the soil to dry out before re-watering, and as the days begin to cool and shorten, allow even longer periods between watering. If you are keeping your Madagascar jasmine too wet then you will find that the leaves will turn yellow and start to drop. If this over-watering isn't corrected then it will eventually kill the plant. Conversely, if the plant is kept too dry, the leaves will lose their gloss and will start to wilt, which again, if not corrected will result in the death of the plant. However, if picked up in time, a quick watering will often revive the plant. When they are in full growth they can tolerate temperatures over 40 degrees Celsius, so long as they have sufficient water, but it will do far better in a 20 - 30 degrees Celsius temperature range. During the summer growth season, it will require as much sun as you can possibly provide, plenty of water, high humidity and a balanced fertilizer. To give it a helping hand, the Madagascar jasmine will do well with a top dressing of well-rotted farm manure in the spring, then through the rest of the growing season give a monthly application of a weak mixture of fish emulsion, bone and blood meal.